Recently I discovered a wonderful thing – bircher muesli. I’ve never really been very good at doing breakfast, despite my best intentions. I religiously start my day with a cup of coffee (with another wonderful thing I’ve fallen in love with – almond milk) and I make the boys breakfast, which at the moment is cereal. I’m usually so busy I don’t really think about feeding myself – I’ll get something later, I’ll tell myself. Next thing I know it’s 11.45am and I still haven’t eaten. I know it’s bad for me. I’ve heard of bircher muesli before but I wasn’t sure it would appeal to me – soaking oats in milk overnight? Hmmmm. I thought it would be like eating cold porridge – no thanks! But the idea of preparing it the night before made me think that this could be the solution to my skipping breakfast issue – so I thought it wouldn’t hurt to give it a go. The first recipe I tried was from Ottolenghi. The recipe says to use it as a blueprint – change it up and add whatever fruit/nuts/seeds you like. I used grated apple, chopped dates and hazelnuts – and I loved it. Delicious. You can find the basic recipe right here. 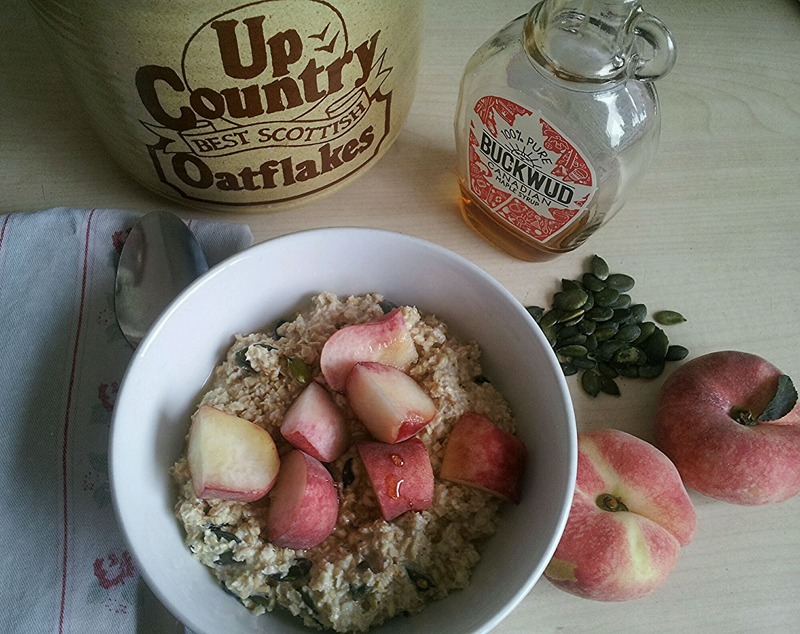 Another recipe I’m sharing with you today is this overnight bircher with peaches. I found the recipe in the brilliant new book “A modern way to eat” by Anna Jones. I adapted the recipe to suit what I had available in my cupboard. I was so impressed by the taste of this – and I’m very pleased to report – very far away from anything resembling cold porridge! I can now see why people have been raving about Bircher for years! But I do think the good quality vanilla bean paste works wonders here. I use Neilson Massey. The evening before, place the oats and seeds in a bowl. Pour over the almond milk, maple syrup, vanilla bean paste and lemon juice. Stir well, cover and place in the fridge overnight. The next morning, remove your bircher from the fridge. 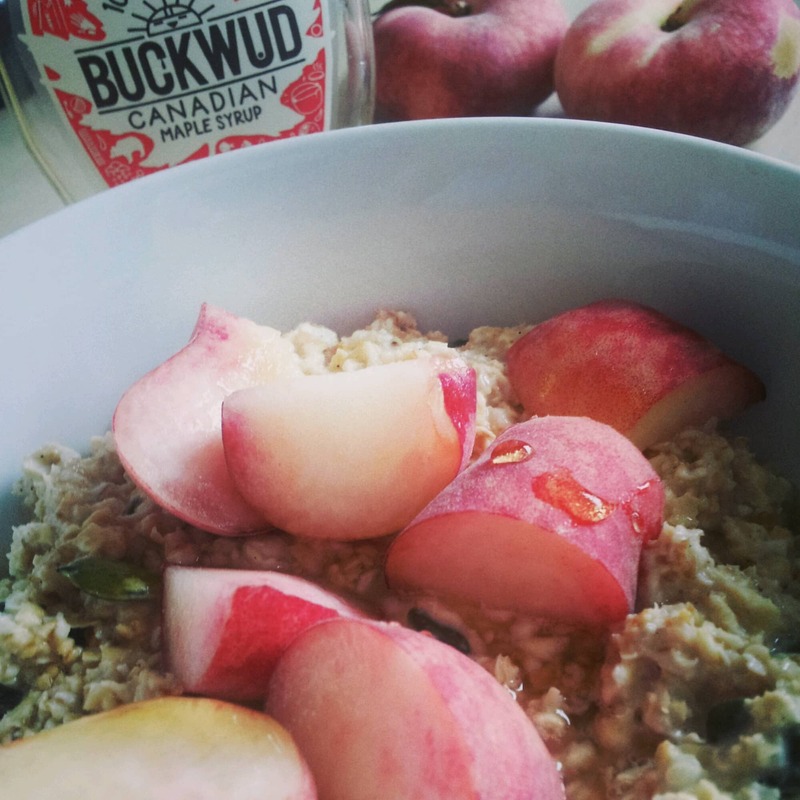 Slice your peaches or whatever fruit you’re using and tumble on top of the bircher. Top with Greek yoghurt and a extra dash of maple syrup, if you like! Previous Post: « Happy 4th July! I love it too now Anna, I never thought it would be my thing but I was proved wrong!